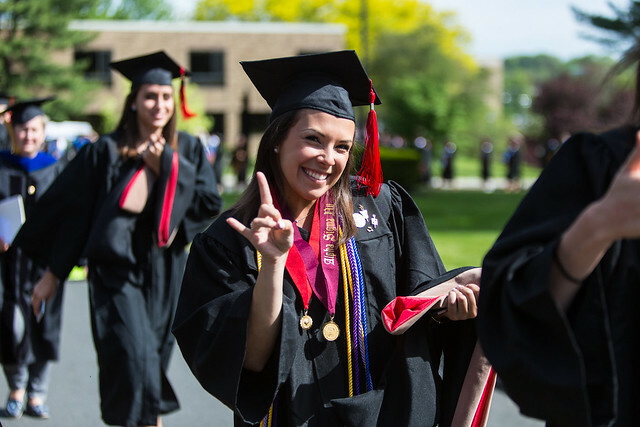 During Fairfield University’s 67th Commencement exercises on Sunday, May 21, the Class of 1951 — the University’s very first class — was honored as part of the University’s ongoing 75th Anniversary celebrations. The nine men representing their class — many veterans of World War ll — donned their robes and sashes to watch as the Class of 2017 received their degrees. Among those members of the first class present were Raymond Longden, JD, recognized by the Guinness World Book of Records as having “Refereed more football games than any other referee in America,” for officiating well over 2,000 games spanning all levels of the sport, including professional, college, prep school, high school, and Pop Warner. During the undergraduate ceremony, an honorary Doctor of Laws degree was given to Rev. Sean Carroll, S.J., who is the founding Executive Director of the Kino Border Initiative (KBI), which started in 2009 to serve migrants that travel between Nogales, Arizona and Nogales, Sonora (Mexico). In 2015, the KBI provided nearly 43,000 meals, shelter for 482 migrants, and medical assistance for over 3,500 sick and injured persons. Dianne Dwyer Modestini, an internationally renowned conservator of Old Master and 19th Century paintings, was given an honorary Doctor of Humanities degree. Modestini launched the Samuel H. Kress Program in Paintings Conservation in 1989, where she guides students through the restoration of paintings, including using many technological advances. An honorary Doctor of Laws degree was given to Stephen Braga ’78, who was named one of the “Top Ten Criminal Defense Attorneys in the United States” by U.S. Lawyer Rankings and who, along with his wife Kathy, run a law firm dedicated to serving, primarily, the underserved and underrepresented within the legal system. Later Sunday afternoon, the graduate ceremony speaker Juanita James, the president and CEO of Fairfield County’s Community Foundation, spoke of the importance of service to others. James has received numerous awards as a result of her leadership and volunteer service, including the NAACPs “100 Most Influential Blacks in Connecticut;” the 2012 Stamford Public Education Foundation’s “Excellence in Education,” award, which recognizes people who have made an impact on public education; and Stamford’s “Citizen of the Year” in 2010, among others. James received an honorary Doctor of Laws degree at the ceremony. Also at the graduate ceremony, Sr. Patricia Eck, C.B.S., received an honorary Doctor of Science degree. Sr. Patricia was elected Congregation Leader of the Sisters of Bon Secours in 2009. As Congregation Leader, she is responsible for ministries in France, Great Britain, Ireland, Peru, Africa, and the United States. In 2011, she received the Cross Pro Ecclesia et Pontifice (the Cross for the Church and Pontiff), the highest honor given to a member of a religious community by the Vatican.